The 10 most effective ways of losing weight and why it’s more bad news for Bake Off fans! Weighing yourself every day is the most effective way to diet, according to a new survey. Switching off TV cookery shows like The Great British Bake Off is the second best weight loss trick. Using smaller plates came third. The results come from a new poll of 1,000 dieters by weight loss firm Forza Supplements to find the ten most effective ways to lose weight. 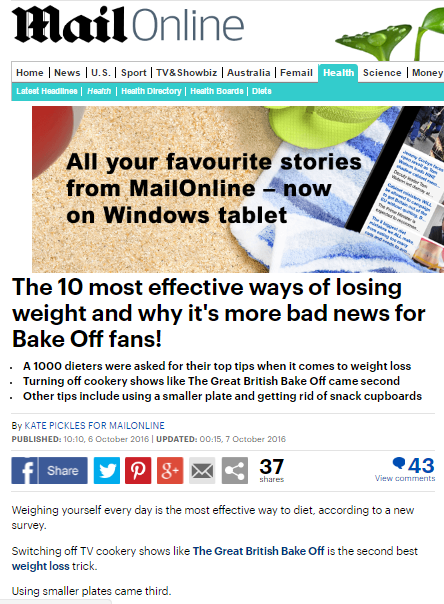 So while this may seem like a story on the Bake Off, it’s little more than a reminder by a producer of diet supplements that diets are important, because we all need to find ways to stay slim, and if you don’t want to give up your favourite TV shows in order to stay in shape, perhaps there’s a chemical solution that Forza can sell you. Forza Supplements managing director Lee Smith said: ‘We all think we know the secret to effective dieting, so we thought it would be useful to find the ten tips that really do work. ‘It is interesting how destructive popular TV cookery shows like The Great British Bake Off can be to regular diets. ‘It’s watched by more than 11 million people a week and it is inevitable they are going to want to try one of those highly calorific recipes at the weekend. This entry was posted in Forza Supplements and tagged daily mail, Forza Supplements, Kate Pickles, lee smith on October 10, 2016 by Michael Marshall.